If you’ve been following along with Reviewer’s Revival since a while, you know that I’m a huge Hammond organ aficionado. That said, I’m always excited at the prospect of reviewing any newcomer to the specialized niche of tonewheel organ emulation. Early in 2017, such a newcomer was introduced to us by independent developer, Ray (just Ray); founder and owner of GG-Audio. Early adoption of GG-Audio’s “Blue3” wasn’t as accelerated as hoped for. For one thing, the naming convention is not dissimilar to Rob Papen’s favored soft synth, “Blue 2”. Another plausible conjecture was the unexpected default color scheme used by “Blue3” – you guessed it: blue. If you’re an ol’ skool Hammond maven like I am, you’re expecting to see warm, earthy hues, and graphical textures reminiscent of walnut, cherry, and mahogany woods. Thankfully, these are now the very skin choices within Blue3 v2. And since I've mentioned UI (User Interface) choices, I’m very pleased to report that Blue3’s UI is fully re-sizable between 70 to 200 percent – sure to accommodate most contemporary screen resolutions. Overall, I assess Blue3 v2 to be solid prospect for anyone in need of a good quality tonewheel organ VI (Virtual Instrument). I know many of us have long held GSI’s “VB3” in high regard, considering it to be the de facto standard where modelled tonewheel emulations are concerned. However, Blue3 v2 is a worthy contender and is poised to offer itself as a fit challenger. Priced moderately at $99 (USD), Blue3 won’t break anyone’s bank account, but neither can it be considered a cheap, ‘No brainer’ deal. 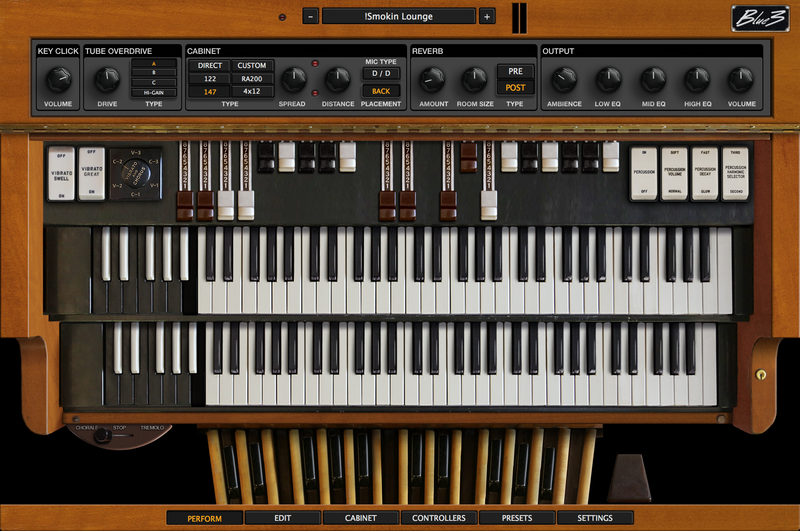 However, Blue3 v2 does not emulate a single organ – rather, it distinctly models five different tonewheel organs; as well as boasting exquisite, high resolution/retina-ready graphics (resizable, to boot). This VI produces good quality Hammond tones and a convincing rotating speaker (Leslie®) experience. Taking these laudable factors into view, Blue3 v2 rapidly appreciates in value. Let’s flip those Run and Start switches shall we . . . It is a policy of mine to never draw overtly numerous comparisons between similar products, since the intention of Reviewer’s Revival is to review each product solely on its own merits. Nevertheless, given that Blue3 has by its very nature, waded into a digital pool predominated by the time-honored VB3, I can’t help but point out differences between the two. In a perfect world, all we tonewheel VI users would buy a license for each one, owing to the fact that both emulations have their strengths and their weaknesses respectively. Generally speaking, I’ve always considered VB3 (v1.4) to be a little bit bottom-heavy. While it’s true that VB3’s lower registers are full, warm and robust, its low end can actually swamp its own mids and upper frequencies if you aren't careful. Whenever I instantiate VB3 (v1.4) into a mix, I most nearly always need an aggressive high pass filter behind it, as well as a moderate Q cut around 360 Hz – 420 Hz. On top of this, one has to work a little harder to coax screaming rock sounds out of VB3. It’s doable, but it requires fully extended drawbars while diming out its “edge” control. On the other hand, Blue3 v2 can scream like a banshee rooster. It could be said that some of its tonewheel sets somewhat lack girth and weight in the low mids and bass (such as some of its C3 models), but a neatly provisioned, three-band EQ stack, and configurable tonewheel curves, remedies any EQ imbalances quite nicely. And since I've broached the subject, rest assured that Blue3 has a lot to offer regarding its tonal palette. There are variations aplenty of the most beloved Hammond types: ranging from old, weathered B3 tonewheel sets, C3 varieties, A-100 distinctions, L-100 assortments, and even a CV tucked into the bevy. Each Hammond model is dished up in configurations spanning vintage wax capacitors, early 70s red mylars, right up to pristine, refurbished recaps. I return to a previous point: in a perfect world, why should we have to choose? Let’s all have a copy of VB3 when its sonic footprint best suits a track, and also the lovely Blue3 v2 for those times when a little more forward presence is in order. There isn’t a specific FULL vs DEMO installer – the product is unlocked after you’ve entered your legitimate (purchased) serial number and registered email address. The installer contains a fair bit of data (UI skins, assorted plugin formats, and et cetera.) weighing in at approximately 156 MB. Of course, Blue3 v2 is a cross platform, 32 & 64 bit accessory, available in AU, VST and AAX setups. Let's not forget that there never was an AU, VST, nor AAX version of VB3 (v1.4) made available for MAC OS. Fortunately, Guido did finally compile a native 64 bit version for newer Windows systems. Activation is simple and hugely appreciated by those of us who are not keen on C/R and dongle protection schemes. No phoning home, no yearly WUP, and no yearly ZDT – just a good ol’ dependable, easily-backed-up, serial number authorization. Haters gonna hate, stealers gonna steal – but for those of us who conduct ourselves honorably, it’s absolutely wonderful to not be encumbered with unforgiving, temperamental copy protections. Thanks, Ray, for leaving the CPU cycles and our patience intact with a solid serial protection. A nod of appreciation and gratitude toward GG-Audio is owed to the fact that Blue v2 is a FREE upgrade for customers who bought the original debut release. Many will proclaim that VB3 reigned as king of the virtual-B3 hill for over 12 years (as of the date of this publication). Understandably, its UI may certainly be considered small by today’s High Def standards. 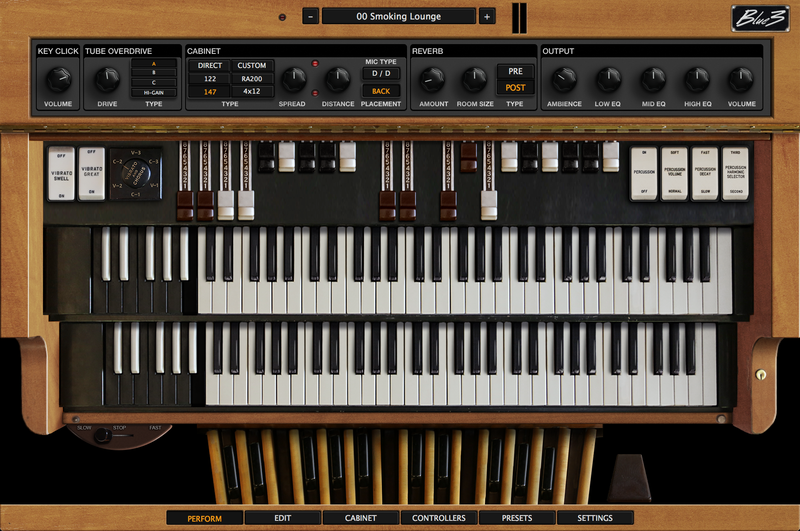 I really liked VB3’s GUI; its overall motif kept one mindful that it was emulating a big ol’ Hammond tonewheel organ. Alas, VB3 didn't facilitate any kind of built-in presets management – you were confined to importing / exporting fxb files or relying on your DAW’s preset manager. To a degree, the “VB3-II” UI size has been somewhat improved, but it still isn't scalable. VB3-II comes with a decent preset manager, but Blue3’s preset system is more robust and outlaid with a broader scope – such as various categories, for example. Alright, enough about the competition - what about Blue3 v2? In both aforementioned aspects, GG-Audio’s Blue3 v2 far outpaces its elders. Even at the default GUI size of 100 percent, Blue3 v2 occupies a reasonable portion of screen-estate, coming across as engaging and inviting. Each component is tastefully and logically laid out, making it an easy, intuitive tie up. Moreover, Blue3 v2 boasts a full-featured, easily navigated preset manager. ​Thankfully, Ray has eschewed the VI’s former *ahem . . . ‘unique’ (Blue) UI color scheme and has replaced it with an attractive, faux wooden design. On offer is a selection of four skins, otherwise labeled as ‘Finishes’: Blonde, Cherry, Mahagony and Walnut. These are accessed by right-clicking anywhere on the VI’s ‘wooden’ cabinetry. Crack open the champagne, kids! We now have luxurious, engaging beauty to enthrall us. Click on the images below to view full-sized, high resolution pictures. Along the bottom panel of the GUI you will find a row of six buttons: Perform, Edit, Cabinet, Controllers, Presets and Settings. Each of these displays a different UI page. Personally, I tend to favor SDI (Single Document Interface) designs, such as this one that Blue3 v2 employs. Blue3’s sleek, intelligently laid-out UI promotes a speedy workflow and eliminates ‘floating windows clutter’. It’s reasonable to assume that most of a user’s time will be spent on the main screen: ‘Perform’. Here you have access to all the usual Hammond organ parameters, along with basic control over key click, overdrive operation, rotary cabinet type, reverb settings, and equalization. Whenever deeper configurability is required, the individual options pages reveal plenty of expanded choices. ​All assorted knobs and sliders respond smoothly to mouse movements with a nice, ‘just right’ amount of weight and responsiveness. Alt + click returns a control to its default value, while Ctrl + click or right-clicking generally pops up a sub menu where midi assignments and midi polarity can be made. Of course, Midi Learn is at hand here as well. ​Attractive color choices, tidy UI arrangement, tastefully contrasted elements, and crisp, anti-aliased text elements ensure that Blue3 v2 is legible and enjoyable to use. As any serious tonewheel organ player would expect, the entire spectrum of Hammond controls and switches are on deck – eg. Vibrato, Scanner Type, Percussion and so forth. Furthermore, they are situated relative to where a player would reach for them on a real B3. Like mentioned earlier, all basic VI properties are conveniently available on the main page, but a user can really dig in and personalize the instrument’s sonic details on the ‘Edit’ and ‘Cabinet’ pages. Within this area you can also set a key split range, allowing you to divide a normal keyboard into upper and lower manuals, as it were. The sound sculpting capacity on board here is immense. A user can fine tune their individualized Hammond tone like heretofore unheard of! Well, in comparison to sample libraries and most nearly all competing organ VIs, that is. ​​Pulling the CABINET page into view will bring a gleeful smile to any tweaker’s mug. Herein we may position the three virtual microphones in a dizzying number of arrays. *Note, however, that stereo configuration is not available for the DI nor the 4x12 cabinet selections. In addition to stereo field placement, a user can readily choose to mic up the cabinet’s front or the more open-sounding cabinet rear. ​A handy built-in tweak specific to the Leslie® brake/stop setting is the ‘Front Stop’ button. While engaged, this ensures that the horn will always face perfectly centre-forward whenever the rotary switch is in the ‘Stop’ position. Removal of the Leslie® horn's diffuser is convincingly emulated, allowing the user to pick the standard ‘diffuser in’ setting, or a more profuse doppler effect (removing the diffuser). ​Last, but not least, the famous Memphis sound is effortlessly implemented with a simple click of a button – aptly labeled “Memphis”. For those who aren’t familiar with this slang, it is simply the process of disabling the rotating drum in the bottom of a Leslie® cabinet. This was a practice often used on early Blues/Jazz/R&B recordings in and around the Memphis, Tennessee region. ​Needless to say, rotary speeds – individually configured for both horn and bass – and their respective acceleration/deceleration rates are quickly dialed in on the Cabinet page. A cool nugget of attention-to-detail that I totally dig about Blue3 v2 is the animated rotary graphics – when the rotary is set to slow/chorale, you’ll see the drum and horns swirling slowly. Once ramped up to fast/tremolo speed, you’ll observe the elements spinning all a-tither. ​You can select from a four different microphone configurations – for example, place a pair of stereo dynamic mics on the horn and a condenser mic on the bass. Alternately, feel free to use condensers on the horn and a dynamic mic on the lower drum. Use dynamics all around . . or condensers . . . you get the idea. Unlike many amp sims, the microphone types are broadly categorized as either condenser or dynamic. In other words, don’t expect to choose specificly labeled mics, such as SM57 or Neuman U47. ​Most nearly all of Blue3’s knobs, switches, drawbars, and et cetera, can be midi-learned and assigned on the main page. However, for an easy aperçu perspective, the CONTROLLER page is indispensible. At just a glance, the user will immediately see each midi-mapped component displayed brightly in blue, with the CC (control change) value shown in clear, white text. Of course, perfuntory midi assignment, midi-learning, and whatnot, are conveniently available. Beyond typical CC manipulation, one may freely assign a control to a specific midi channel (Ch.1 – Ch.16), or set up a customized CC range for a component – eg. 16 – 100 instead of 1 - 127. At the bottom of the CONTROLLER window, we can also make octaval transposition adjustments by one or two octaves – incrementally or by decrements. Upper, Lower and Pedal manuals can each be individually assigned to any midi channel (Ch.1 – Ch.16) facilitating complete organ set ups. For those who haven’t the luxury of owning a dual manual Nord or Crumar "Mojo", a traditional Hammond configuration can be facsimiled by arranging two midi keyboards on a double tiered stand, and assigning them to midi channels one and two respectively. Commonly, most players set the upper manual to midi channel one, the lower manual to midi channel two, and the pedals rooted to midi channel three. ​By my estimation, Blue3 v2 rises well above its peers in regard to preset management. Out of the box, there are a few sensibly labeled categories (folders) ready and waiting for you. However, a neat little trick that I've learned is that you can right click in the preset panel and launch your operating system’s default file manager -- revealing the presets’ folder structure; in my case, it’s Windows Explorer. Therein, you can create new folders at will. The next time you launch Blue3 v2, your newly made folders will be listed within the preset manager. Likewise, you can copy or move presets from one folder to another. Unfortunately, this must be done through your operating system’s file manager by cause of there being no means of accomplishing these tasks within Blue3’s preset manager itself. Pitchbend Range and Percussion Registration. To close out my commentary of this section of our Blue3 v2 exposé, it’s obvious that GG-Audio hasn’t left any stone unturned – at least, none that I can think of. Every configuration option that a user could ever want is sure to be found across the five categorized options pages. Let’s face it; the highest priority of any potential customer shopping for a Hammond VI, is the believability of the sound, right? It might look amazing with beautifully crafted, photo-realistic graphics. It might be loaded to the rafters with fancy-schmancy features. It might host dozens of gidgets, gadgets and whizz-bang bling, but ultimately what matters most is the authenticity and accuracy of the sounds that a virtual instrument can reproduce. I assure you, Blue3 v2 sounds good – very good. ​I’ll put my neck on the line and openly admit that I consider Blue3 v2 to be a good degree better than most nearly every older virtual Hammond VI – including sample libraries. But, does it sound better than its contemporaries, such as: AcousticSampleS “B5-V2” or Genuine Soundware’s “VB3-II”? That’s a very difficult question to answer emphatically. This is not my way of trying to evade the question or play politician – it truly is a difficult contest to judge. ​If you read my (2017) review, and saw the accompanying ‘show n tell’ video about “B5-V2”, you’ll know that it’s a tonewheel emulation force to be reckoned with! Another monumental organ VI release is Guido Scognamiglio’s recent VB3 redux: “VB3-II”. ​Contrariwise, “VB3-II” can scream like a new- born at midnight feeding time, but it can actually be too aggressive if you aren’t careful. Which is best – “Blue3 v2”, “B5-V2”, or “VB3-II”? ​It is my Honest-to-God opinion that each one of these three Hammond organ VIs is great within its own rights. Each one has exceptional strengths as well as potential weaknesses. ​​Furthermore, you can tweak the response and character of the selected tonewheel profile by making adjustments via the ‘Condition’ controls located on the EDIT page. What’s more, you can also modify the tonewheel levels of a given delineation. ​For the sake of brevity I won’t delve into the custom tonewheel sets which are also on tap. In a nutshell, these are provisioned for anyone who enjoys creating and tweaking on a deeper level. Clicking on the “Edit Custom Tonewheels” button brings up the customization page. From here you can custom tweak the default tonewheel set – all 91 individual tonewheels . . .
Optionally, you can draw in a curve with your mouse. If you’d prefer, you can also copy predefined curve from any of the existing tonewheel presets as your starting point. Blue3 v2 sounds authentic within a mix. 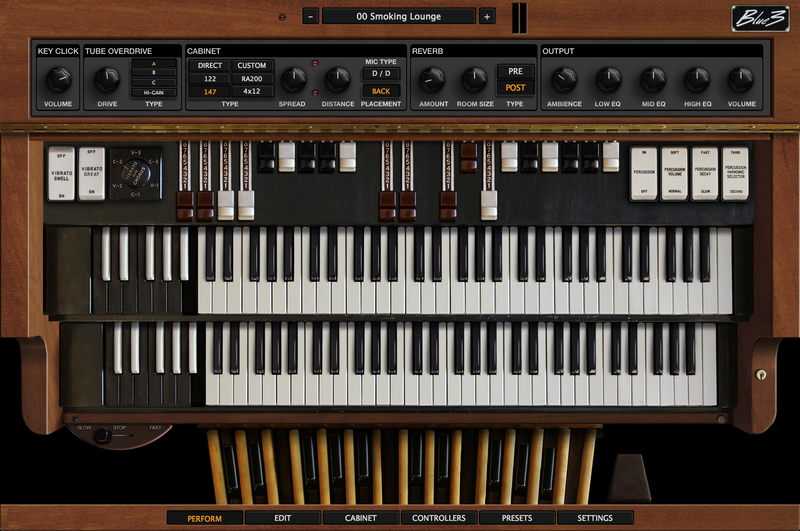 This virtual instrument truly encapsulates a satisfying, highly convincing Hammond organ experience. Whilst played solo, it oozes old school Hammond charm and holds up well under close scrutiny. It can scream with rock n’ roll abandon, or it can sooth the weary soul with pure Gospel tonality. Jazz geeks needn’t be afraid to attempt some green onion peeling either. I promise that GG-Audio’s C++ masterpiece capably covers a very broad musical spectrum with aplomb. Introducing a judicious amount of ambient air via the inconspicuous ‘Ambience’ knob (PERFORM Page) will result in a highly convincing, life-like dimension. Well programmed, realistic-sounding early reflections cause the instrument’s sound stage to come alive. This will add a breathing, organic, naturalism into the mix – more a perception (or feeling) than an obvious effect. As regards the onboard reverb, it’s actually quite good. I suspect that this is a room reverb algorithm, and it sits amiably enough in a mix. Two simple controls manipulate the reverb – namely ‘Amount’ and ‘Size’. It’s a pleasant reverb reminiscent of the sound heard in Voxengo’s original “OldSkoolVerb” plugin. It doesn’t suffer from undue metallic ringing or other unpleasant artifacts. While the onboard reverb isn’t going to necessarily win awards on its tod, it is a perfectly usable built-in FX that is barely noticeable to your CPU. Each of the five included virtual cabinets liberally doles out its own unique sonorous temperament. To my ears, the emulated 122 cabinet is the most familiar, and dare I even say, expected rotary tone on accommodated. This modelled selection boasts a gratifying heft on the low end and a well-balanced upper frequency response. Overall, I consider the 122 to be the mellowest of the lot and it may certainly be deemed a very good, classic vibe well suited to Jazz, Gospel, and Blues. If you’re looking for a more forward, aggressive tone, the simulated 147 cabinet will deliver in spades! This one dispatches a meaty low end. The 147’s low mids are less congested than the 122 whilst it churns out searing, athletic high frequencies. As a general statement, rock and fusion players will really dig this one. Mind you, I tend to favor the 147 over the 122 for other genres too – I like the cleaner, more defined projection of its high frequency horn. More aggressive still is the GG-Audio creation: “Custom”. Principally, this cab is kinda-sorta a tricked out 147. Touting higher output amplifiers, and extended frequency range (both bass and treble), the “Custom” doesn’t occupy the sparring partner’s chair – it brings a TKO excitement into the ring. To be specific, the Custom cabinet is modeled after a "Bill Beer" High Powered Leslie -- the hot-rodded rotary cabinet of choice for countless rock and roll tours. The RA200 is a unique bird among the flock. It has a strong upper midrange presence, a pleasantly modest low end, but as a rotary speaker, it just doesn’t have the typical swirl n’ whirl that we associate with Leslie® cabinets. Of course, it wouldn't - it's modelled on the mid '70s Yamaha RA200 cabinet made famous by David Gilmour. If I had to describe the sound of this cab with one word it would be: “transistor”. Where the 122, 147 and Custom models all do a decent job of impersonating tube-driven amplifiers, this one (without sounding bad) comes across with a more immediate, non-valve tone. A nice finishing touch to the modelled cabinets collection is the 4x12 unit. I suspect that this one is based on a typical Marshall-esqe guitar cab, and for obvious reasons doesn't support any sort of rotating, doppler effect. Notwithstanding, cranking some tasty ‘TUBE OVERDRIVE’ through this cab will definitely take you into Lorded, er I mean lauded, Deep Purple territory. You’ll be tempted to start riffing like a “Highway Star” for hours. I haven’t published a review of Genuine Soundware’s “VB3-II” yet so I need to be scrupulous with my elucidation of Blue3 v2. However, I can assuredly report that this virtual instrument aptly covers the same kinds of tones that B5-V2 produces, and it can step confidently into the general territory that VB3-II is known to dominate. To be honest, “B5-V2” is likely the most realistic sounding of the three VIs mentioned in this article, and it has a really, really good rotary emulation built in – incorporating 6 or 7 different cab types, actually. That said, it can’t quite match Blue3’s upper register prowess. On the other hand, I’m not sure that “VB3-II” can match Blue3’s smooth, solid low end when Blue3 is configured to use a set of wax caps and the 122 cabinet. Then again, at this high end level of modeling, it might simply be a matter of taste – courses for horses, as it were. If you have the inclination and the disposable scratch, then surely invest in all three organ VIs – “Blue3 v2”, “B5-V2” and “VB3-II”. They each have outstanding qualities and unparalleled attributes that their counterpoints haven’t. Nonetheless, Blue3 v2 is special in that it covers such a broad range of Hammond/Rotary tones – and does so very well. It is unarguably a broad-gauged, solid performer. Blue3 v2 reproduces very convincing tonewheel organ sounds and top notch rotary speaker emulation. Tying things together, it’s important to highlight the fact that Blue3 v2 also boasts a wonderfully accurate Hammond feel, in that its key click idiosyncrasies are satisfyingly velocity sensitive. Are you on a desert island? Need a realistic sounding Hammond VI? Blue3 v2 is a good huckleberry for the job. *Wink. CPU consumption is the category where Blue3 v2 indubitably takes us into the Promised Land, every time. This delightsome VI is a blessing ‘Fo sho’; perhaps compiled with heavenly manna-grade code. It’s possible – Hammond organs rocked churches before they were dragged into juke joints, ya know . . . jus’ sayin’. On my i7 7700 HQ laptop, Blue3 v2 never demands any more than 12% of a single CPU core – and that at low latency, real-time settings. Blue3 v2 is one of the best tonewheel emulations of the century. As mentioned throughout this article, it can’t claim to be uncontested in every plausible regard. Be that as it may, Blue3 v2 doesn’t ever need to worry about being relegated to the pinch-hitters bench or be made to sit at the back of the class. It greets the eye with impressive, scalable graphics, and configuration options aplenty. The user interface is tastefully and intelligently laid out so that every conventional Hammond control is at hand, just where one would expect to find it. Of greatest importance, your ears will be soothed and titillated with sumptuous, true-to-life Hammond sonorities and vibe. In drawing things to a close, Blue3 v2 offers a bounty of Hammond indulgence for very little CPU expense – and for only modest pocket expense actually. BEST user interface of any Hammond emulation out there. Attractive, well laid-out GUI and sensibly arranged controls. High quality, convincing tonewheel sounds. HUGE selection of tonewheel sets. Complete control over character details such as leakage, flutter, crosstalk, transformer noise and so on. Good collection of cabinet choices to fit various musical genres. Simple and intuitive to configure. Works as expected, NO finicky surprises. Modestly priced – actually priced lower than both “VB3-II” and “B5-V2”. Simple serial number protection. No need of an iLok dongle nor C/R internet activation. With a bit more code tweaking, I don’t doubt that Blue v2 could sound even better – maybe even as echt as “B5-V2” in the lower registers, and as precise as VB3-II’s upper range. Nonetheless, only the most discerning ears can hear the tiny disparities whilst being played solo. In a mix, Blue v2 always sounds really, really good. ​Be sure to check out the audio demos while you're there! ​Stay In The Loop - Subscribe Today! Exclusive Reviewer's Revival discount codes? No SPAM - Just the good stuff! Brother Charles is a freelance writer, Gospel music artist and minister. Charles had been a professional touring musician during the nineties; working primarily as a lead guitarist in the Canadian country music industry. Brother Charles is also involved with music production and quality home recording. Intellectual Copyright - 2019 - All rights Reserved. This review may not be copied or reproduced in whole, nor in part, without express written permission from the author. Brother Charles, please bug the developers of all three Hammonds with your suggestions for improvement and ideas for future updates! There is room for more, especially with modeled Blue3 V2 and VB3 II !!! Thank you !!! Thanks for your comments. Believe you me, the developers read my reviews. In all fairness, professional commentary does help give developers a clue about what to take back to their whiteboards, but all I can do is make suggestions and honestly report my findings. I do bug 'em once in a while though . . . *Grin.